At first glance, the cosmology of the Srimad-Bhagavatam might seem like a wild fantasy. Here are four ways to make sense of it all. Chaitanya Mahaprabhu remarked, “In every verse of Srimad-Bhagavatam and in every syllable, there are various meanings.”(Chaitanya-charitamrita, Madhya 24.318) This appears to be true, in particular, of the cosmological section of the Bhagavatam, and it is interesting to see how we can bring out and clarify some of the meanings with reference to modern astronomy. 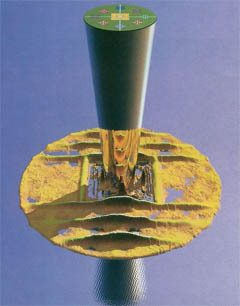 When one structure is used to represent several things in a composite map, there are bound to be contradictions. But these do not cause a problem if we understand the underlying intent. We can draw a parallel with medieval paintings portraying several parts of a story in one composition. For example, Masaccio’s painting “The Tribute Money” (Figure 1) shows Saint Peter in three parts of a Biblical story. We see him taking a coin from a fish, speaking to Jesus, and paying a tax collector. From a literal standpoint it is contradictory to have Saint Peter doing three things at once, yet each phase of the Biblical story makes sense in its own context. 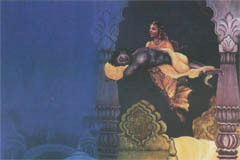 A similar painting from India (Figure 2) shows three parts of a story about Krishna. Such paintings contain apparent contradictions, such as images of one character in different places, but a person who understands the story line will not be disturbed by this. The same is true of the Bhagavatam, which uses one model to represent different features of the cosmos. 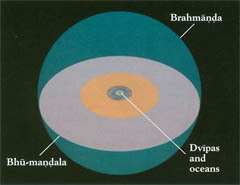 The region within the shell (Figure 3) is called the Brahmanda, or “Brahma egg.” It contains an earth disk or plane—called Bhu-mandala—that divides it into an upper, heavenly half and a subterranean half, filled with water. Bhu-mandala is divided into a series of geographic features, traditionally called dvipas, or “islands,” varshas, or “regions,” and oceans. 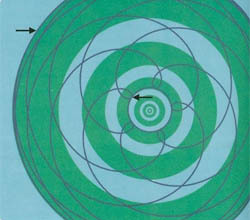 In the center of Bhu-mandala (Figure 4) is the circular “island” of Jambudvipa, with nine varsha subdivisions. These include Bharata-varsha, which can be understood in one sense as India and in another as the total area inhabited by human beings. 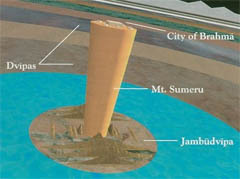 In the center of Jambudvipa stands the cone-shaped Sumeru Mountain, which represents the world axis and is surmounted by the city of Brahma, the universal creator. To any modern, educated person, this sounds like science fiction. But is it? Let’s consider the four ways of seeing the Bhagavatam’s descriptions of the Bhu- mandala. We begin by discussing the interpretation of Bhu-mandala as a planisphere, or a polar-projection map of the Earth globe. This is the first model given by the Bhagavatam. 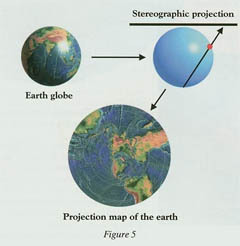 A stereographic projection is an ancient method of mapping points on the surface of a sphere to points on a plane. We can use this method to map a modern Earth globe onto a plane, and the resulting flat projection is called a planisphere (Figure 5). 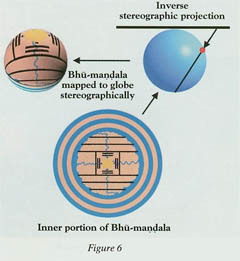 We can likewise view Bhu-mandala as a stereographic projection of a globe (Figure 6). In India such globes exist. 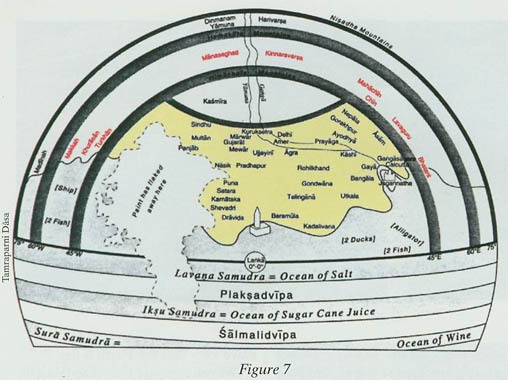 In the example shown here (Figure 7, next page), the land area between the equator and the mountain arc is Bharata-varsha, corresponding to greater India. India is well represented, but apart from a few references to neighboring places, this globe does not give a realistic map of the Earth. Its purpose was astronomical, rather than geographical. 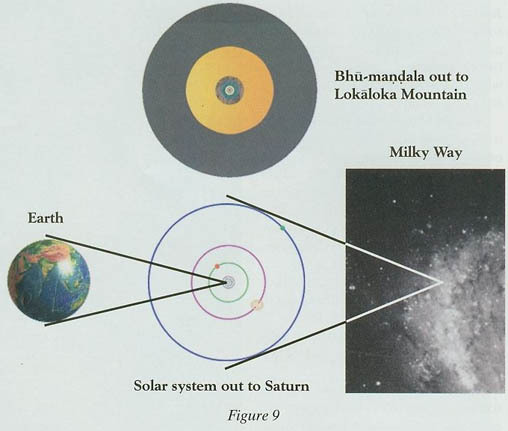 Not only does the Bhagavatam use the ecliptic model, but it turns out that the disk of Bhu-mandala corresponds in some detail to the solar system (Figure 8). The solar system is nearly flat. The sun, the moon, and the five traditionally known planets—Mercury through Saturn—all orbit nearly in the ecliptic plane. Thus Bhu- mandala does refer to something flat, but it’s not the Earth. 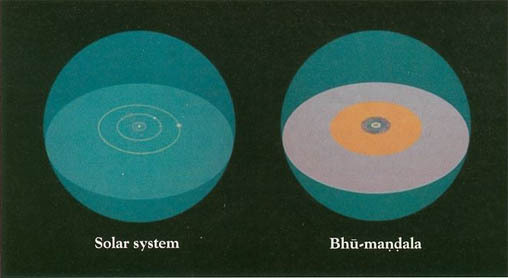 Furthermore, the structures of Bhu-mandala correspond with the planetary orbits of the solar system (Figure 9). If we compare the rings of Bhu-mandala with the orbits of Mercury, Venus (Figure 10), Mars, Jupiter, and Saturn, we find several close alignments that give weight to the hypothesis that Bhu-mandala was deliberately designed as a map of the solar system. Jambudvipa, the central hub of Bhumandala, can be understood as a local topographical map of part of south- central Asia. This is the third of the four interpretations of Bhu-mandala. In the planisphere interpretation, Jambudvipa represents the northern hemisphere of the Earth globe. But the detailed geographic features of Jambudvipa do not match the geography of the northern hemisphere. They do, however, match part of the Earth. 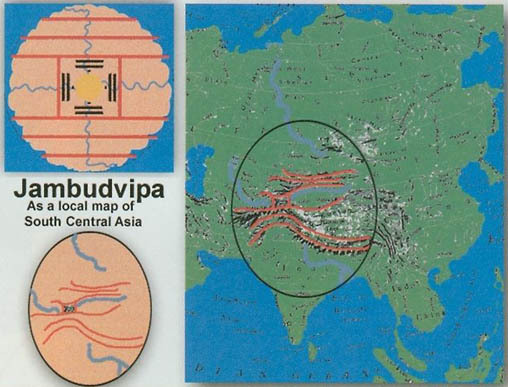 Six horizontal and two vertical mountain chains divide Jambudvipa into nine regions, or varshas (Figure 11,top left). The southernmost region is called Bharata-varsha. Careful study shows that this map corresponds to India plus adjoining areas of south-central Asia. 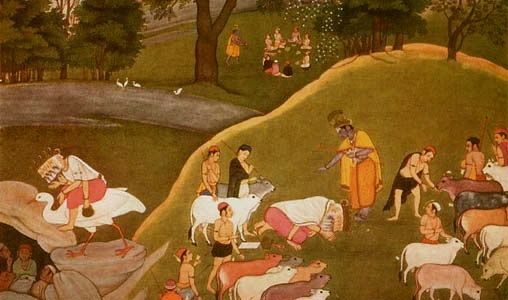 The first step in making this identification is to observe that the Bhagavatam assigns many rivers in India to Bharata- varsha. Thus Bharata-varsha represents India. The same can be said of many mountains in Bharata-varsha. 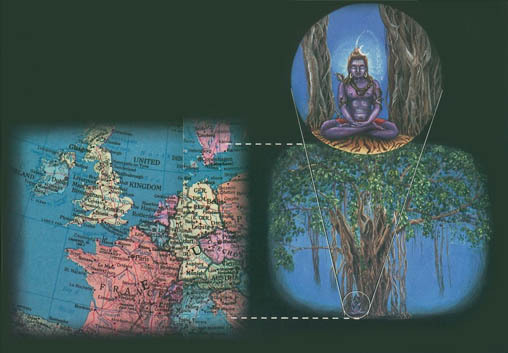 In particular, the Bhagavatam places the Himalayas to the north of Bharata-varsha in Jambudvipa (Figure 11). Besides moving from one place to another in ordinary space, the mystic siddhis enable one to travel in the all- pervading ether or to enter another continuum. The classical example of a parallel continuum is Krishna’s transcendental realm of Vrindavan, said to be unlimitedly expansive and to exist in parallel to the finite, earthly Vrindavan in India. Each of the four interpretations I’ve presented deserves to be taken seriously because each is supported by many points in the text that are consistent with one another while agreeing with modern astronomy. I’ve applied the context-sensitive or multiple aspect approach, in which the same subject has different meanings in different contexts. This approach allows for the greatest amount of information to be stored in a picture or text, reducing the work required by the artist or writer. At the same time, it means that the work cannot be taken literally as a one-to-one model of reality, and it requires the viewer or reader to understand the different relevant contexts. This can be difficult when knowledge of context is lost over long periods of time. In the Bhagavatam, the context-sensitive approach was rendered particularly appropriate by the conviction that reality, in the ultimate issue, is avak-manasam, or beyond the reach of the mundane mind or words. This implies that a literal, one-to-one model of reality is unattainable, and so one may as well pack as much meaning as possible into a necessarily incomplete description of the universe. The cosmology of the Bhagavata Purana is a sophisticated system of thought, with multiple layers of meaning, both physical and metaphysical. It combines practical understanding of astronomy with spiritual conceptions to produce a meaningful picture of the universe and reality. In 1974, he received his Ph.D. in mathematics from Cornell University, where he specialized in probability theory and statistical mechanics. He went on to do research in quantum physics and mathematical biology at the State University of New York at Binghamton, Cambridge University in the United Kingdom, and the La Jolla Institute in San Diego. Sadaputa Dasa wrote eight books, produced six videos on science and philosophy, and wrote many articles for scientific journals and for Back to Godhead. His last book was titled God & Science: Divine Causation and the Laws of Nature. His previous book Maya: The World As Virtual Reality explains how this world can be considered a virtual reality. His explanation accommodates empirical evidence for many phenomena that contemporary theories of consciousness cannot explain. Another book, Mysteries of the Sacred Universe, discusses evidence of advanced astronomical knowledge in India’s ancient Puranas. Sadaputa Dasa also designed exhibits using computer animation and multimedia techniques to present the Vedic cosmology and worldview.